Cole Mitchell, a native of Juneau, has been proudly selected by the Petersburg Rotary for the 2018-2019 Youth Exchange year. We met Cole in January at the Winter Orientation and Country picking conference. 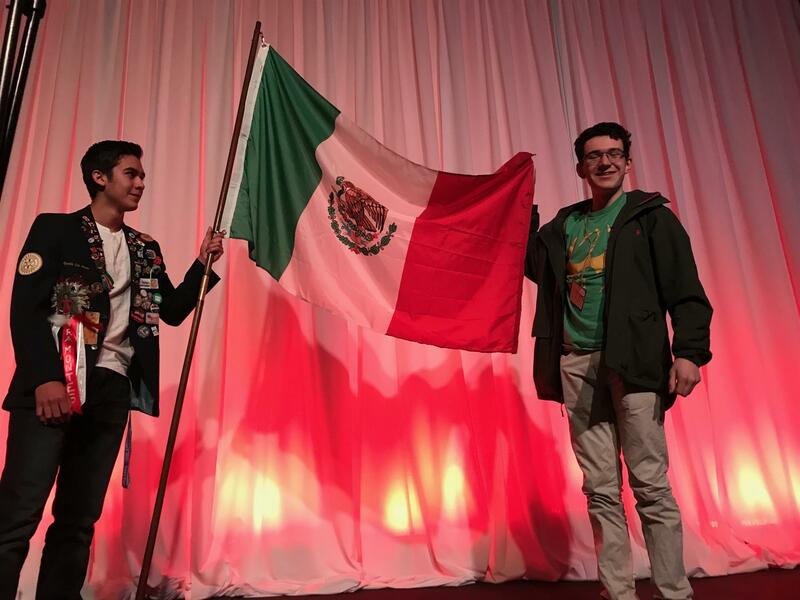 Cole applied as an exchange student for a Juneau club and was accepted as an alternate. Our club was very happy to be able to pick Cole up and sponsor him for his year abroad in Puebla Mexico. He leaves in August to start his year of exciting adventures. Last week, he came to visit us here in Petersburg and to attend the weekend SE YE Spring orientation. At our meeting he shared with us that he loves theater, acting, playing the piano, and has experience in speaking Russian. He even played a beautiful piece of music on the piano. His positive spirit and hard working attitude showed us all that he will be a success on his exchange. Cole has been diligently planning by using Duo Lingo every day after school, and it shows in his language skill sets. After meeting a native Spanish speaker, Eunice Isrealson, she commented that Cole will definitely be ready by the time August hits. 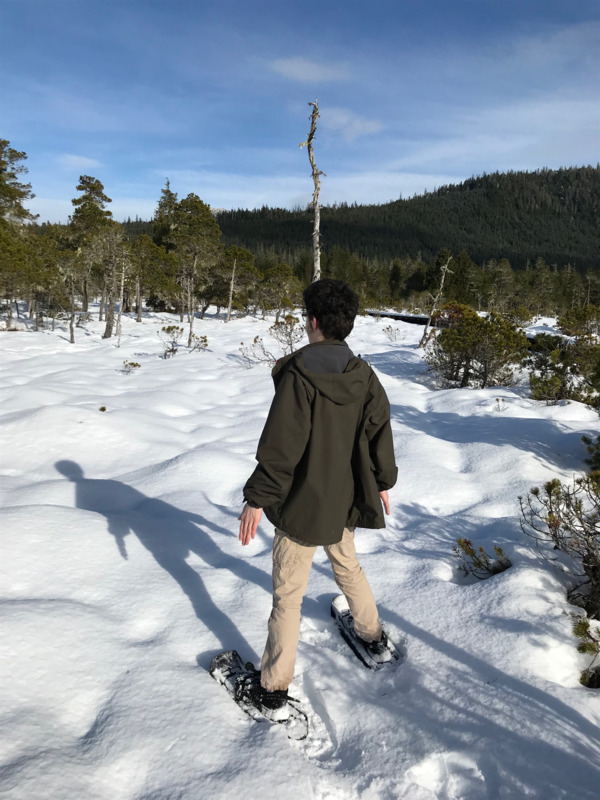 While here, he was able to go snow shoeing for his first time ever, at Blind River Rapids, and enjoyed every minute of it. He jumped, walked backwards, ran, and enjoyed the sunny day. We are excited to have Cole as part of our ambassadorial team and look forward to hearing from his adventures in the future!! David Berg (SE Area Coordinator), Debbie Bushnell (Outbound Coordinator), Jamie Letterman (Inbound Coordinator), and muliplte Youth Exchange Officers spent the weekend providing a jam packed learning session for our inspiring kids. This weekend was focused on teaching our upcoming out going exchange students what to expect, and how to be true ambassadors of Rotary and the United States. Our hearts are full with appreciation and the dedication that everyone has shown this weekend! Thank you to the Petersburg High School, Petersburg Community Center, and the Lutheran Church for providing learning space, over night space, and fun opportunities!! Thank you to Eunice Isrealson for setting time aside to help some of our students review the dialect and learn the Spanish speaking language. Club President David Byrne, L, pictured with Lt. John Birks of the Petersburg Salvation Army, display trophies Rotary earned in 2014 and 2015. The Petersburg Rotary Club raised the most money of all bell ringers two years in a row. President Kilkenny presented a cake and offered kind words to Rob Thomason on his last meeting as a Petersburg Rotarian. He and his Bride (Susan) are moving to Bend, Oregon. Each year, Rotary selects individuals from around the world to receive fully funded academic fellowships at one of our peace centers. These fellowships cover tuition and fees, room and board, round-trip transportation, and all internship/field study expenses. 1. Professional development certificate: A 3-month program for those with more extensive experience in peace-related fields, in peace and conflict resolution at Chulalongkorn University in Bangkok, Thailand. This program incorporates 2–3 weeks of field study. We award up to 50 certificates each year. 2. Master's degree: We offer master’s degree fellowships at premier universities in fields related to peace and conflict resolution and prevention. Programs last 15¬–24 months and require a practical internship of 2–3 months during the academic break. There are 50 master’s fellowships available. 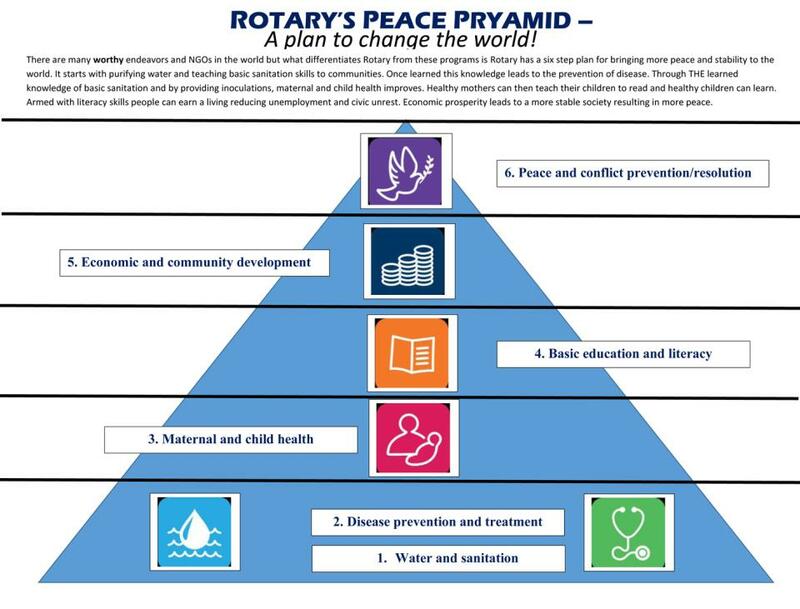 The application form is available online at https://www.rotary.org/en/document/881 Complete information available at https://www.rotary.org/en/peace-fellowships Please feel free to send the link and the information above to anyone you feel would be a good candidate. 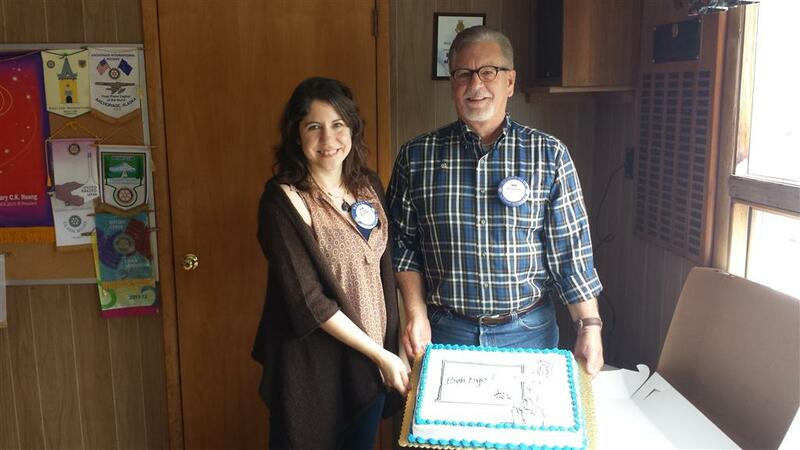 Keni Campbell of the Juneau Rotary Club is this committee’s representative for Rotary clubs in Southeast Alaska. If you know of someone interested in Petersburg Rotary please share this site with them! Click on the link below. The site will open in a new window. One of the pillars of Rotary service is our support of the Intl. Rotary Foundation which works to support initiatives such as clean water, literacy, health, and polio eradication. You can support our club's goal of 100% participation. Consider making your donation of $100 or more to the Rotary Foundation Annual Programs fund to become a Paul Harris Sustaining Member for the 2014-2015 Rotary year. "Every Rotarian Every Year" is our goal. Have you already become Paul Harris Sustaining Member for the 2014-2015 Rotary Year? Will you be next? (If you have given directly to the Foundation via their website or other method for the 2014-2015 Rotary year, please let Chad Wright know so he can include your name as appropriate.